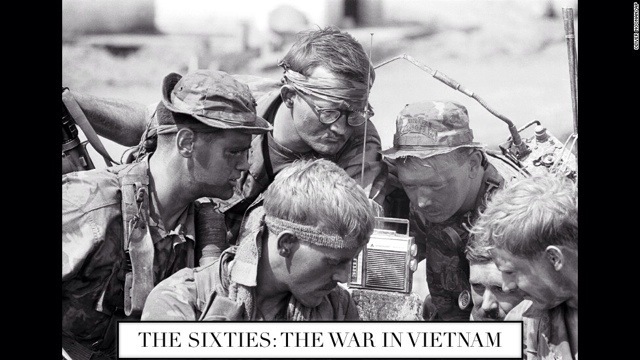 This week, CNN’s 10-part documentary, “The Sixties”, focuses on The War in Vietnam. It was The Sixites prelude to the War In Iraq. It went on forever and ever amen! And, after a while, everyone forgot why they were fighting in the first place. Totally endless and mindless and overflowing with heartbreak and senseless deaths. As a result, a plethora of protest music by key musicians from Jimi Hendrix to The Beatles, dominated and mirrored our reactions to this war. The USA involvement in this war happened as an effort to destroy or curtail widespread Communist activity in South Vietnam. The Sixties: The War In Vietnam airs on CNN on Thursday, June 19th at 9:00 PM and will be repeated numerous times on CNN over the weekend. Do you have any opinion about The War In Vietnam? Which war-related song was your favorite? Please share in the comments section below. Hello, does anyone know if these episodes are shown again? I missed part one and tonight’s show. It is very painful seeing things about the Vietnam War as it impacted my life so negatively. There were six guys from my school killed in the war, but worse of all – my 19 year-old cousin got killed in 1967. So many guys came back addicted or soon-to-be addicted to alcohol and drugs. AND FOR WHAT? What was accomplished? KariAnn. They will be replayed all weekend on CNN. In the evening around 8:00 or later. Just keep checking. I an so sorry for your many losses if life during this stupid, useless war. How horrific for you and for their families. Nothing was accomplished. Absolutely nothing. All those beautiful young lives wasted and gone. Very, very sad. I am also sorry for your losses, Kariann. And I agree that it was a useless war. Just as the war in Iraq was for naught. And it is so incredibly sad that so many lives were lost, including innocent Vietnamese and Iraqis. Besides the loss of life, and the ruin of many lives from drugs, PTSD, etc. which is immeasurable, the extraordinary amount of money spent on these wars is more than any of us could begin to fathom. I always get angry at the people who complain about how much money the government spends on programs to help needy people, when I never hear these same people complain about how much money was spent needlessly on fighting unnecessary wars.